Many times in life, we have stopped on the railway crossing – the “Fatak” closed as everybody waits for the train to pass. It was fun during the early days of life - Getting out of the car, guessing from which side the train would come and then watching in awe as the huge engine whistled past while you try to count the number of bogies in the train. The same process turned into a nightmare on growing up when there was a shift of responsibility to maneuver the car through the scrambled rush that happens after the ‘fatak’ opens up. It didn’t matter where the train was coming from or how many bogies were there. As the train passed, all the focus turned to the smallest of spaces where the car could be pushed in so that you are the first ones to turn out victorious on the other side. Mumbai gave an entirely new experience. 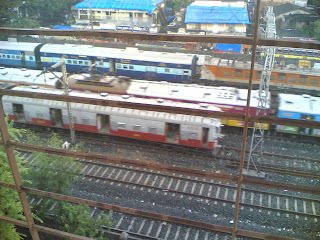 For the first time yesterday, I saw trains stopped and wait for the traffic to go by at a ‘fatak’. It was fun actually – the 5th floor view giving a holistic picture of the entire scene. The roads leading to the fatak on both East and West side were chock-a-bloc with cars, buses and trucks waiting for the fatak to open up. The efficient Local Train service were plying nonstop – not allowing the fataks to open up. After around 15 – 20 minutes the traffic was all over the fatak gates like water just waiting to rush out of a dam whose wall has cracked. 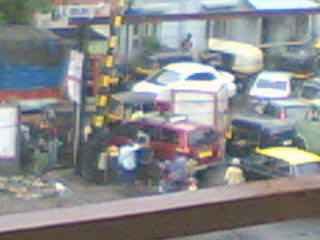 Finally the fatak opened and it was a mad, desperate, impatient rush of vehicles that poured all over the rail tracks. The poor traffic sense of Mumbaikers ensured that a bottleneck was formed and there was traffic jam with cars stranded right in the middle of the railway tracks. As the officials rushed to clear the scene, 2 south going locals and a long distance train could be seen waiting some 200 meters away at Ville Parle Station. There were 2 more suburbs bound trains waiting on the other side. It took 10- 15 long minutes for the rush to clear. Somehow the railway people had managed to reinforce the cracks on the dam again. 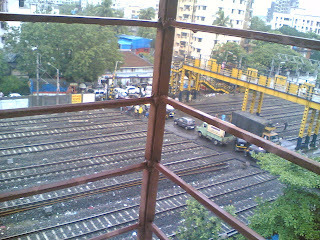 But it provided a fun view of trains waiting for the cars at a fatak! !